London’s streets may be famously paved with gold, but more realistically, they were once paved with wood — quite a lot of streets and an awful lot of wood. As roads were increasingly paved to cope with carriages and later, bicycles, there was a debate about the best sort of material to pave them with — and curiously, it seems that wood was by far and away the most popular options. The more obvious and famous use of stone cobbles to line London’s busier streets had been a practice since the 18th century — replacing crushed stone pebbles or large flat stones. The problem was that granite cobbles were incredibly noisy. You have to think about the din caused by iron horseshoes banging on stone and iron clad wheels rolling over stone to see why urban dwellers were desperate for an alternative. Some early experiments with wooden blocks, based on a hexagonal design in use in Russia’s St Petersburg were carried out around the turn of the 19th century by Mr John Finlayson of Ayr, but not much happened. Following its invention in the 1820s, some streets had been covered with Macadam, which offered a quieter, and smoother ride, but it wore out quickly under the weight of cargo carts. It was in 1839 that the first serious experiment was made with wooden blocks to replace their granite predecessors on the road outside the Old Bailey. However, as with macadam, the wooden blocks wore out quickly. In 1843, a meeting of the Court of Commissioners of Sewers heard appeals to replace the wooden blocks with granite. At the meeting, Mr. Prosser, the Secretary to the Metropolitan Wood-paving Company, had admitted that wood-paving was unsuitable unless pitched and’ sanded over. Despite that, new wooden paving was being laid at the same time outside St James’s Church in Picadilly. It’s worth noting that the blocks were not just rectangular lumps as you might have presumed, but complex interlocking designs, often hexagonal in basic shape. Wooden blocks were however still not that popular, and much can be laid in part at the piecemeal use — for horses switching road surfaces was itself a cause of accidents. These switch-over accidents added to the disquiet about the use of wood for road surfaces. Nonetheless, many local parish councils considered the options of wooden pavements, with cost savings being the usual argument. For example, the parish of St Pancras estimated that 11,000 yards of wooden paving would cost 11s per yard, with just 6d per year in maintenance — vs — granite which cost 4s 6d per year for 3 years, followed by 1s 6d per year thereafter. It is worth noting that at the time, roads were managed by local parish councils, not central government — and the London-wide Metropolitan Board of Works did not exist. This added to the piecemeal approach to paving roads in London. In 1846, the City of London decided to replace its wood paving slabs with granite, which incidentally lead to many a “robust struggle” as people were allowed to just walk off with the old wooden blocks, and many did so for their home fires. By the 1850’s practically all of the carriageways had been paved with granite setts from Scotland. However, the streets were often muddy in wet weather and full of dust in the summer. ‘Scavengers’ were employed to clean the streets and cart away the mud and manure. Granite Setts (as the cobbles are formally known) came mostly from Scotland, but also from Conrwall/Devon, and their distribution around London is largely thanks to the railways, so stone from Cornwall tended to be used in West London, near Paddington, while pink granites from Mountsorrel quarry tended to be found closer to Fenchurch Street station. In that sense, while the granites were chosen for cost and practical durability, not appearance, there were colour differences in the stone depending on where it came from. A lost person might, in theory have been able to identify where in London they were simply by looking at the colour of the stone they were walking over. Nearly 30 years after that original experiment with wooden paving, in May 1869 another experiment as Threadneedle street was paved with compressed asphalt supplied by the Val de Travers Company. Although unpopular with horse owners (and the horses) due to being very slippery when slightly wet, it was popular with the public for the quiet and smooth ride it offered. Shortly afterwards, the streets radiating from the Bank of England were nearly all asphalted. The main problem is that — at the time — asphalt was an expensive option, and granite blocks persisted, despite protests about the noise they engendered. Also, asphalt proved sufficiently unpopular as to spark petitions from horse owners against it. As horse owners were the “car owning majority” of the time, their voice carried great weight with politicians. Safety was also one of the arguments used in favour of the introduction of smaller granite setts after 1844, as they had more edges for horses’ hooves to catch against. It was around this time that wooden blocks started to make a come-back. The improved wood pavement would be lain upon a thick bed of concrete; a layer of planks is placed upon the concrete, and upon these the blocks are set upright in parallel rows across the street. Initially, pine was used for the blocks, and a mixture of asphalt and pitch poured into expansion gaps between the rows of wooden blocks. In 1873, the City of London Police tested the performance of wood vs asphalt, and found over a 6-month trial that horses travelled further over wooden blocks before stumbling in the wet, and that the stumbles caused fewer injuries to the horses. The momentum in favour of wooden blocks was growing. As an aside, one of the other factors affecting the choice of road surface was the ability to clean it. Remember, horses leave muck, and lots of it. After rain, that muck and mud renders roads almost impassible as they became incredibly slippery. Various attempts were made to improve the cleaning of the roads, including an early attempt at an automatic road washer developed in the 1890s. Another problem was while wooden blocks were quieter than granite, they smelt worse! Some of the wooden blocks had a tendency to absorb what fell upon them, mostly horse urine, and on hot days, the stench was said to be noxious. It was that tendency which would later lead to roads being paved with different sorts of wooden blocks, with harder denser wood being used in posher areas, and the poor getting, well, poorer quality wood that more inclined to soak up horsey fluids. Another problem, noted by the impressively named Metropolitan Committee on materials and means of paving the streets of London complained that water could build up underneath the blocks and cause them to expand and become a trip hazard. Despite that, at the time, wood was seen as the least-bad option for paving the streets of the major cities, not just in the UK, but the method was to be found across the world. And wood for streets was a global trade. Wood from Canada, from Scandinavia, and best of all, from Australia could be found on London’s streets. Australian Jarrah proved to be the most durable road surface, being both hard wearing, and resistant to absorbing horse urine. So desirable was the Australian wood, that in 1898, the Jarrah Timber and Wood Paving Company was set up with the specific purpose of buying up forests in Western Australia, and shipping the timber back to London for use in road blocks. One of the more curious experiments was the use of rubber for coating the tops of wooden blocks, either individually, or in sheets lain over the road. While it offered many benefits in terms of reducing slipping by horses and was exceptionally quiet, rubber wore out equally exceptionally quickly. It is worth thinking though that we still today rely on rubber for our street surfaces though — just the other way around from how the Victorians used it. We use it on the wheels of the motor vehicles instead. So while rubber as a road surface failed, in the guise of the tire, it has lived on. In fact, ground up tires are sometimes used as aggregate in new road surfaces, so the Victorian experiments continue. As the motor car started its inexorable takeover of the roads, tire manufacturers would also advertise the merits of their products on wooden blocks — such as this advert from 1922. There has been some doubt at times as to how widespread wooden blocks were in the major cities. The popular image of stone cobbles being so predominant in the mind that wooden blocks must have been a mere afterthought? These does seem to be supported by various reports that wooden blocks were only used in areas where quiet roads were essential, such as hotels and hospitals. However a map of London by Bartholomew’s in 1928 shows clearly the expansive reach of the wooden block road paving method. In the map excerpt below, the yellow roads are all paved with wooden blocks. Only the blue road are where the more familiar stone cobbles can be found. The splashes of green are asphalt. You can see from that not only were the majority of paved roads lain with wood, but that there was a huge variety of road surfaces, even along a single road. In case you think this is all a bit olde-worlde and from times in the deep and distant past, wooden blocks could be found throughout London until just 50 years ago. In 1930, Regent Street was completely re-laid with wood blocks — creosoted Deal wood based on the Firmosec system. In fact, when the new Chelsea Bridge was opened in May 1937, the road surface was lain with wooden blocks made from Canadian Douglas Fir. The Improved Wood Pavement Company’s accounts for that year noted that the company was still stable and performing well. Production of wood blocks for use on roads continued right up to the 1950s. However they were a dying material, and most of the old blocks in-situs across London were lifted in the post-war rebuilding of the city, and the blocks used to heat homes — the smoke from the burning tar and creosote supporting London’s reputation as The Smoke. As it happens, Lord Alan Sugar started his entrepreneurial career salvaging wooden blocks from roads in Clacton that were being resurfaced with asphalt, after he noticed that underneath the old road surface remained a street made of wooden blocks. Wooden blocks are still being dug up — although now they tend to be preserved or taken away for safe-keeping. The most recent batch being dug up by Crossrail near Paddington. In fact, wooden road blocks can still be found in the streets. In Islington, a small section of a side road still has a few rectangular wooden blocks. The paving was relaid in the 1990s, and it would seem that a fresh set of wooden setts lain at the time. They are certainly far too clean and undamaged to be more than 20 years old. You can however find much older remnants in several locations around London, as infill for old manhole covers — such as this one on Farringdon Street, which probably dates to around the time of the last set to be lain, around the 1950s. However, while long since discarded for roads, wooden cobbles might be making a come back — as garden designers look for the next fashion, and horse-yards consider them as a kinder alternative to stone. So London, streets may not have been paved with gold, unless you were a timber merchant, in which case London’s streets lined your wallet with gold. And finally, a theory of where the story about London’s streets being paved with gold may have originated from, is here. I remember in about 1950 when I was a child, our road in Fulham was resurfaced, and the tar-impregnated wooden blocks were piled up at the sides of the street, as the new tarmac was laid. People came out of the houses, my parents included, and took lots of these blocks to burn as fuel, but the tarry stench was appalling, and we never used more than one. I often wonder if this might have contributed to the terrible smogs at the time. Many North American streets used wooden blocks soaked in cresote which were then covered with a thin layer of asphalt. Many survive in older parts of a town, still performing well. Sydney had an extensive network of roads within the CBD that were laid with wooden blocks, this article from the Western Australian The Enquirer and Commercial News of 15 July 1891 gives the results of a wear trial in Sydney and presents Jarrah as the preferred material. 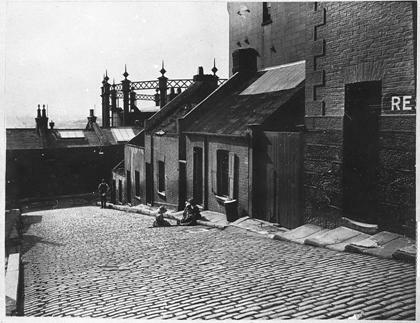 I can’t recall streets being paved with wooden blocks – but I can certainly recall that Lombard Street was paved with rubber blocks, and they were there until quite recently. Fascinating. I have certainly seen wooden blocks in streets around London on several occasions ,unfortunately i cant remember exactly where. Interesting article as ever, but please spell “tyre” the British way! Very interesting – thanks for researching all this and writing it up Ian. Sometime, I think, between 1959 and 1962 my father was working for a road surfacing company. They had a contract for works on part of the Euston Road. This involved removing the wooden bricks some of which came home and were used on our open fire. Boy did they spit. Very interesting to see the background as to why there were wooden bricks. The reason rubber succeeded as a tyre is vulcanisation; heating with sulphur, which was patented in 1844, and makes the material MUCH tougher. I wonder whether the trial with rubber road surface used vulcanised rubber, or the much softer pure rubber. Amazing! You just wouldn’t think wood could offer the necessary grip! I always remember a story my dad told me. Whilst driving through London as a young man (probably around 1950) in his ancient Hillman Minx, the traffic ahead slowed, and as he braked,he happened to be on a short section of wood. He said the car actually seemed to accelerate, as if on ice, and he ploughed into the expensive car in front causing it considerable damage, but leaving the old Minx virtually unscathed! The point of his story was the toughness of the old Minx, but is a good example of how hazardous wood must have been as a road surface! I looked up ‘tar road blocks to see if my memory was correct! Around the end of WW2 my father acquired a load of these brick shaped wood blocks (probably from London where he worked?). He used to chop them into small tinder sticks and use them to start our coal fires. One day I made a little ‘campfire’ in the garden in the sunken garden where I had my sandpit. Following his example which I had so often watched. It went very well. Only when it was finished did I realise that the crazy paving was left with a layer of tar which I could not move! Dad was Not pleased and I got a rocket!! Interesting information and conversation. My family has been in the end grain block business since 1946. My dad came home from WWII and was marketing and installing creosote treated wood blocks in machine shops and factories all over the USA. We still serve the industrial flooring needs of Alcoa, GM, US Steel, Caterpillar, etc. Although our business is more decorative today. We’ve been producing blocks for exterior application. We’ve found some very effective species, and have installed them on streets, patios, and roof tops. An interesting article – thanks. I’ve recently returned from a visit to Western Australia and while walking near Denmark at the Harewood Forest Walk Trail ( http://www.denmarkwesternaustralia.com/denmark-wa-travel-destinations/harewoodforest.htm ) there were some heritage signposts and one mentioned about a a very large order of Karri beams destined to be used as street paving blocks in London. The company was Millar’s Timber and Trading Company. I can send a photograph if required. Please could you let me know where the hexagonal wooden setts are in relationship to St James’s Church Piccadilly. Do you know of any wooden setts in London of this type or the familiar rectangular shaped setts. When asked why he could not swim, my father would say that he missed swimming lessons at school because a tar block fell out of the fire on to his leg. He lived by Camel Lairds in Birkenhead.I wonder if it was street paving they were using for fuel. This would be between the wars. There is a section of street with end grain wooden paving on Belvedere Road, in front of County Hall, the old GLC building. The street is scheduled for resurfacing sometime possibly next year. If any one knows the history of the paving, I would be glad to hear it. Lindsay, whether you check back on your comments is a moot point. Nevertheless, there’s such a thing as ‘quiet or silent asphalt’ which used to be expensive because of its novelty. It’s now being specified for its kerb appeal in new developments and has passed enough tests to make it tarmac’s equal. Groups of sleep-deprived urban residents have regained their equilibrium when they have come-together to lobby the relevant authority. It has simply been used to replace worn-out noisier surfaces when they fall due for renewal.